Crocosmia 'Star of the East' produces the largest star-shaped flowers of any variety and is one of the very latest to flower, still looking good in the garden until October or even November. 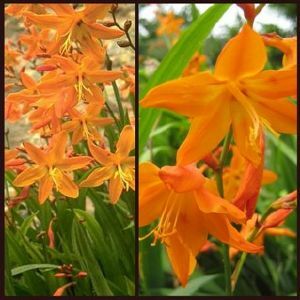 Crocosmia 'Star of the East' produces sprays of large, clear orange flowers on tall 60cm stems. Crocosmias, commonly called Montbretia, are corms which form dense clumps of upright sword-shaped foliage. In mid-summer this makes a good background for the sprays of bright, usually orange flowers,carried in branched spikes. It is ideal for growing in swathes through the herbaceous border and the flowers are excellent for cutting. In very cold areas, the plants need a sheltered site and the bulbs should be lifted and stored over winter.